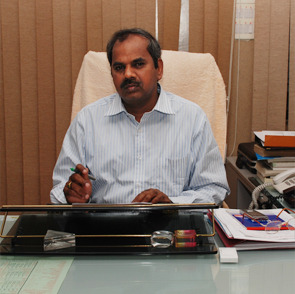 Dr. E Saibaba Reddy is presently a Professor of Civil Engineering JNTUHCEH. He served and held several Academic and Administrative positions including Vice Chancellor of Veer Surendra Sai University of Technology (VSSUT), Burla – Odisha, Rector (JNTUH), Registrar (JNTUH), Director of Academic and Planning (JNTUH), Principal (JNTUHCEH), Vice-Principal , (JNTUHCEH), Coordinator EDP (JNTUHCEH), Head of JNTUHCEH. He obtained B.Tech. (Civil Engg) from JNTU Hyderabad and M.E. (Hons) from University of Roorkee, and PhD. from University of Nottingham (U.K). He did two Post Doctoral Research Programmes one from Saint Maries University, Halifax, Canada and the other from University of Birmingham, (U.K). He held various administrative posts and developed the university with his projects and developmental activities. Notable among his awards are the American Society for Testing Materials Award for the year 1998 for outstanding research paper, Shamshare Prakash Research Award 2000 from University of Roorkee now IIT, Roorkee, Commonwealth Scholarship for Ph.D. and Commonwealth Fellowship for post-doctoral research. He was Chairman/Member of a number of Expert Committees formulated by the A.P. Government to examine the causes of failures and to suggest solution to the problems. He was the Convener EAMCET 2007 and EAMCET 2008 and Convener PRITACET 2008. He also served as Expert Committee Member of AICTE for scrutinizing project reports as well as was the member in the Board of Reviewers for the Institution of Engineers journal. Editorial Board Member of International Journal of Earth Sciences and Engineering. He is the member/fellow of as many as ten professional bodies in the field of Civil Engineering and Technical Education. He has visited as many as 20 foreign Universities in UK, US and Canada. Ground improvement techniques and Environmental Geotechnology. 4. Commonwealth Fellowship (London) for Post Doctoral Research. 6. UGC Scholarship of M.E. Studies. 7. Commonwealth Scholarship (London) for Ph.D.
8. Merit Scholar ship at B.Tech. 10. Member, Academic Council, State Board of Technical Education and Training, Andhra Pradesh. 11. Governing Body Member for Sree Vidyaniketan Engineering College, A. Rangampet, Chittoor Dist Governing Body Member for CMR College of Engineering and Technology, Kandlakoya, Medchal Mandal, Hyderabad. 13. Expert Committee member for M.Tech. Courses, Nagarjuna University, Guntur. 14. AICTE Expert member for Inspection of Colleges. 18. Editorial Board Member for International Journal of Earth Sciences and Engineering. 19. Member Board of Reviewers for Institution of Engineers Journal. 20. Expert Committee member to examine the causes for distress in an Over head water tank at Nizamabad. 21. Represented the JNTU as Soil mechanics Expert in the Expert committee formulated by Govt. of A. P. to examine the causes and find the remedial measures for the failure of a summer storage tank at Anantapur.